We know that to be on time on our market we must be in advance! 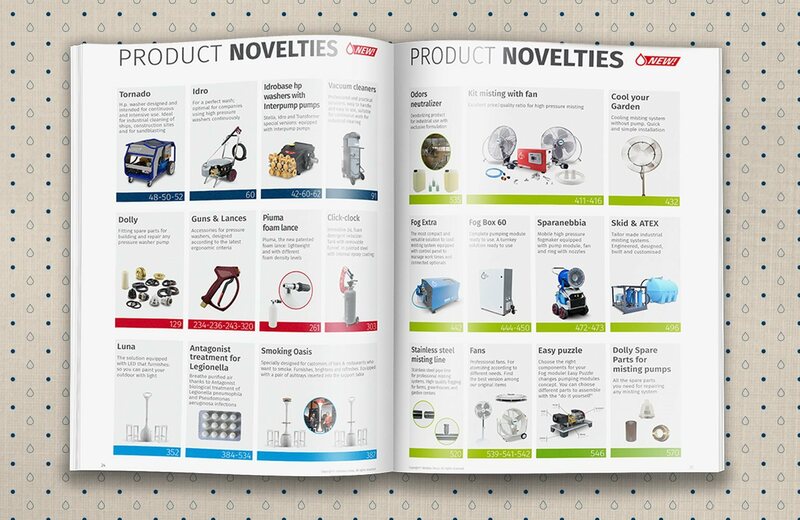 This is the reason why the new Catalogue of Solutions will be already available in next few days all over the world. You can also browse it online in 6 different languages (Italian, English, French, German, Spanish and Russian). The two pages of the new products are inserted between the Company Profile and the nearly 600 pages dedicated to the articles of Idrobase Group different brands. Idro, Idrobase professional hp washer is a functional solution for the high-pressure washing, in particular for car wash and for washing of vehicles. 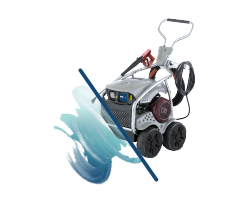 It’s a cold water high pressure washer with the usual features of professional Idrobase hp washers. External pump, which means halving the time required for maintenance, and a motor that always "breathes" fresh air. A simplified electrical system (with only one switch), because we know that electronics and setting functions are most often an annoyance for those who use the pressure washer continuously. The machine is equipped with a tubular frame set made of steel with thick chrome plating, which gives particular sturdiness. You can choose Idro both By-pass and Total Stop. According to the different model, you will have pressure from 150 to 250bar, flow rate from 15 to 21l/min, electric motor with 1450Rpm and power from 7,5hp to 10hp. 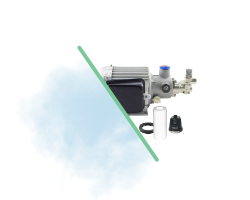 And, for the first time around, you can buy Idro with Interpump pump as standard equipment. Piuma is the new foam lance launched on the market from Club dei Riparatori by Idrobase Group. This foam lance has been specifically designed for the well-being of the car wash professionals. The most interesting plus of this new foam lance, if compared to the traditional foam lances, is the special detergent regulator patented by Idrobase Group. You can adjust the foam density from a washing with a very dense foam to a less aggressive washing. You can choose three different possible adjustments to obtain three different foam concentrations just by rotating the regulator. Lightness is the other key strength of this model, made of aluminium and AISI 304 stainless steel. With this choice, Piuma weighs one-third less than the traditional brass models on the market. You can still choose Piuma in the traditional brass model with POM delivery. Furnishing solutions designed for outdoors and in particular for the smoking area of clubs, bars and restaurants. 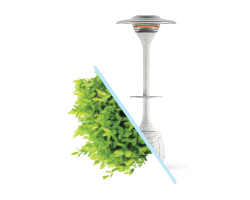 In addition to furnish, with differences for the various models, Smoking Oasis products can: light up the night, warm the cold weather and cool the hot weather, thanks to the integrated misting system. Smoking Oasis are real meeting points to chat with friends thanks to the support base for drinks, with two ashtrays, and the USB port to charge smartphones and tablets. Fog Extra is a compact and versatile fog module: the solution to cool, create fog effects, humidify, and suppress dust and odours in small and medium sized areas. This solution is the best for many field of application thanks to the wide range of settings available with the new and advanced control panel. This new panel gives the chance to program pause/work timing on daily/weekly basis, controlling both temperature and humidification. With the new safety system in the event of pipe breakage on the fog nozzle lines, the system automatically stops. The fog module can be set up with different features according to the flow rate and the number of nozzles: axial pump with 2 pistons (for flow rate between 0,5l/min and 1l/min); axial pump with 3 pistons (for flow rate of 2l/min, 4l/min and 6l/min); crankshaft pump with 3 pistons (for 8l/min and 11l/min flow rates). Sparanebbia Lince is one of the biggest news from Idrotech by Idrobase Group. 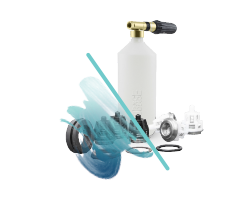 Lince is a high pressure system complete with fan and ring of nozzles, ideal for dust and odour suppression. This is a particularly adaptable solution with a very easy handiness thanks to the small dimensions (800x600x1200mm) and the standard trolley kit. Lince is the ideal solution for suppression of fine dust, in small and medium sized areas such as in renovation of buildings and when handling dusty materials. With 60bar pressure, 1l/min flow rate, 230V/50Hz power, and only 55kg weight. The fan has a 6m jet, 4.000Rpm and 2.820m3/h air flow rate. The ring has 7 nozzles with	flow rate 30, the pump module has 1.450Rpm 230V-50Hz and 2 ceramic tipped pistons. The tank has a 30L capacity with 30 minutes autonomy. The new high pressure stainless steel misting line has been designed for greenhouses, farms, horticultural and floricultural productions. 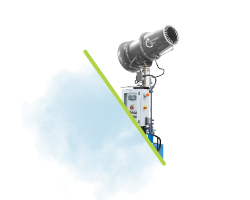 For professional misting systems, in order to guarantee a high quality fogging. 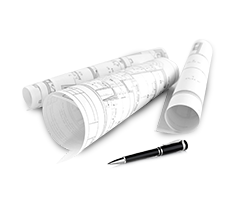 This system creates the ideal microclimate for any application. All hoses used are made of stainless steel AISI 304, while fittings and anti-drip nozzles are made of stainless steel AISI 303.